Quizlet is an online application that allows creation of flash cards for educational learning. Additional features within the program are gaming and quiz formats for the information contained within the flashcards. Feedback on mastery of the subject is provided through statistics on each quiz attempt. There is also a discussion board format for use by group members. 2. For shared usage in a group, the user simply needs to email other participants through the internal social interface. 3. For mobile applications there are multiple applications that will work with the Quizlet database. However, you must download them separately but multiple options are on the Quizlet website. You simply need to select the preferred operational platform. To see an example of this online tool, please click on the link below. Select the My Friends and Groups tab and search for lkcoble to find the flashcards that I have created. 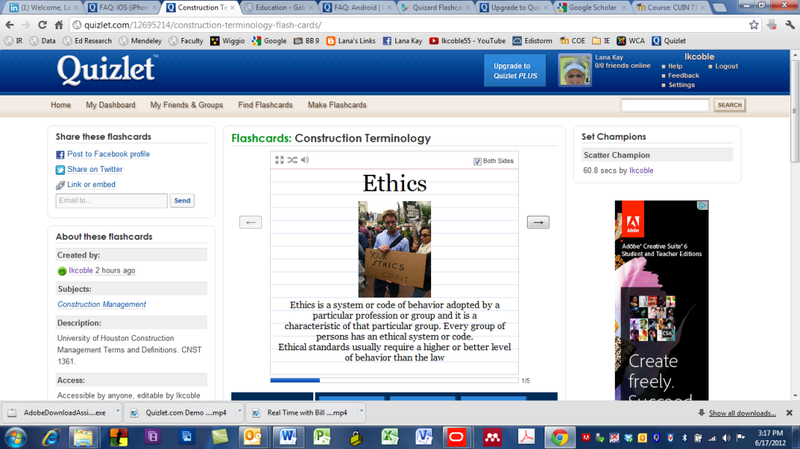 The example created flashcards on the definitions regarding construction management ethics. This application has tremendous potential in preparing students on subject content. There are pre-generated flash cards on popular subjects and it is easy to create cards on your desired subject. 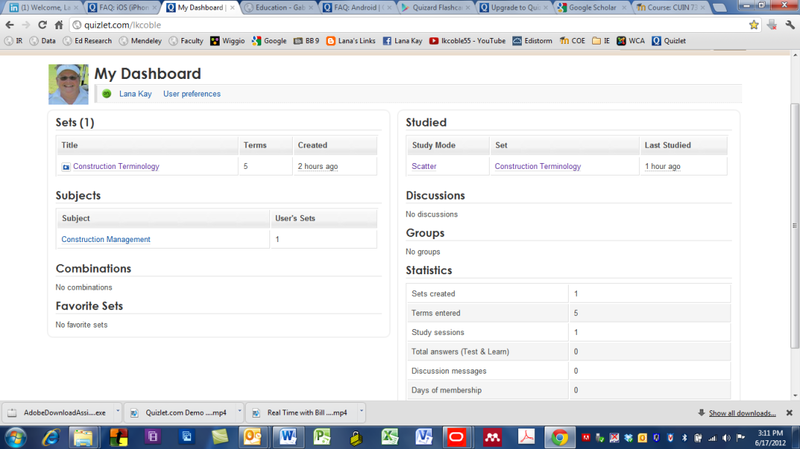 The group sharing function also enables collaboration between study partners. Today’s students are so connected to their computers that it provides the means to study traditional content in an electronic format. Robustness is enabled by the gaming and quiz elements of the application which creates interesting activity in the learning process. This application has the ability to span multiple levels from K-12 through higher education. The other positive aspect of the application is that it is very intuitive and requires little instruction to utilize. The greatest involvement is in data input which would also aid in the learning process. I can visualize this product being used for outside classroom study and preparation on the subject matter so it would prepare the students to be more engaged in the actual classroom discussion. This application could also be used in test preparation and review. This product is a keeper! 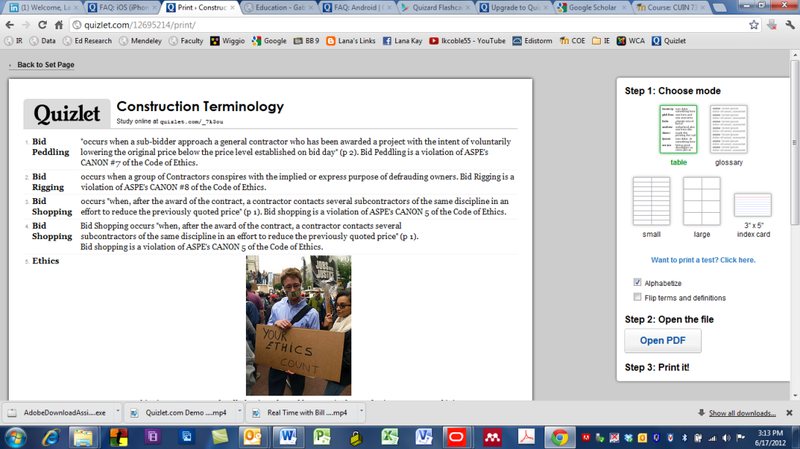 To enhance understanding of the content, the program allows uploading photos into the flash cards. This is particularly helpful for those students with visual learning styles. Of significance for any teacher, importing knowledge into the program is intuitive and relatively easy. Watch this instructional video to see just how easy it is. A social interface is included in the platform where students and teachers can create open or closed groups. Further development includes a discussion board where students can communicate with one another during the study process. Another advantage is there are many mobile applications that utilize different devices, specifically android and apple. With the explosion of cell phones from both providers, students are not likely to have the same operating system, so this flexibility is critical for group collaboration. In the category of cool, this is it! There are several interactive games that utilize the information on the flash cards so that students maintain interest in studying. In addition, the dashboard will keep your scores and times on the games so competitive learners are further engaged. Multiple gaming options also create increased durations of study time which only enhances the learning process. 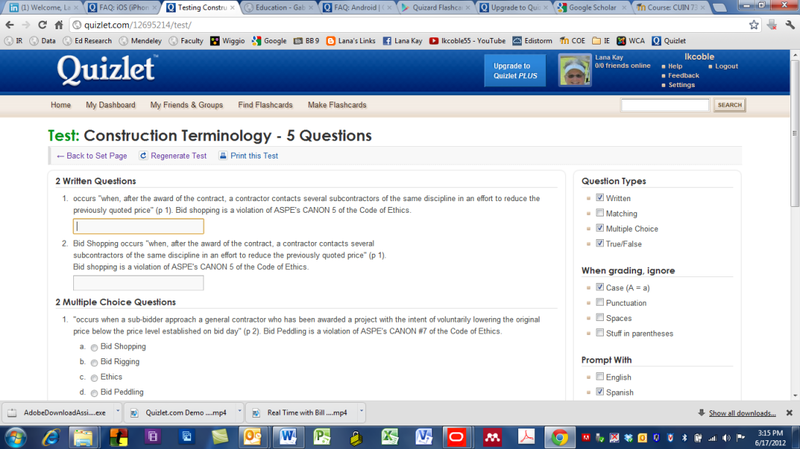 The program will automatically create exams based upon the content in your flash cards. The functionality also includes random sequencing so students truly learn the material and not memorize the answers based upon consistent sequencing. The interface for printing the flashcards is a very nice feature. It allows printing as a single document so if you want to distribute to other students or classmates it only requires one click. The free version allows 8 flash card sets at a time. The only limitation of the free version is that you can’t upload personal photos to define concepts in the flash cards. The upgrade version is $15 per year which is the equivalent to two Starbucks latte’s and well worth it if you have photos to enhance the understanding of the subject matter. As described above, Quizlet is basically a database program and requires an additional shell program to provide mobile access. While this is a slight inconvenience it is intuitive and easily performed and there are numerous applications available depending upon personal preferences.